KEEPING the costs of running your business to a minimum is a key element in ensuring its success. If you are buying office supplies, packaging products and IT equipment then you should check prices on the internet first. 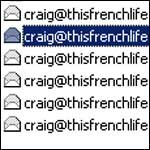 AN easy way of ensuring your website is seen by people is to put a small ‘signature’ at the end of each email you send. This is a short line, for example saying, Enjoy the delights of south west cooking at The Lincoln Restaurant, then your website address. ALTHOUGH building a website is a key element for any online business making sure it converts sales is vital. 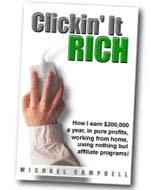 In Clickin It Rich, by Michael Campbell, he offers a range of advice and information on setting up small sites based around affiliate links. THE use of affiliate marketing is not a new phenomenon just think how long Amazon has been around. 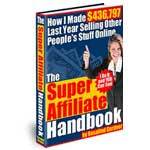 And in the Super Affiliate Handbook, Rosalind Gardner, claims that it is possible to make a living promoting other people’s products. ONE of the things you should consider when using a website to promote your business is to automate as much of it as possible. But one of the most time consuming features of your site will be answering emails, which often ask you the same old questions. 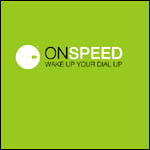 BROADBAND services are increasingly popular but there are still many people using dial-up access for the internet. A SIMPLE way of putting a few pennies in your pocket is to run an auction on eBay or buy something for a bargain price. 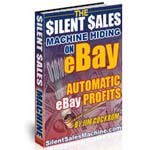 If you are new to the service then take your time getting used to how it works by browsing around the eBay site. USING the internet to help sell products and even services can open your market to a world wide audience. Using your own simple website and a simple way to promote your product are key elements of making a success of an online business. IF you are running a number of affiliate links through different services it is vital that you can get links quickly and easily. LinkShare is a US based affiliate network that offers you the chance to sell items provided by some of the biggest retailers, including Macys and Waterford Crystal. PROVIDING as many ways as possible to pay for your products can often be the key to making a successful sale. But what could be easier than paying there and then with your website right in front of your potential client.